This disc is a distinguished showcase not only of the love that British composers harbour for the horn, but also of the unique tradition of British horn playing which is considered as the most scholarly in the genre. The earliest work on the programme is Searle's "Aubade" which was commissioned by Peter Pears and Benjamin Britten and premièred in June 1955 by Dennis Brain. Divided into three clearly defined sections, it is full of warm romanticism that gives it a very special attractiveness and is one of Searle's most accessible works. The other three works on disc are contemporaries of each other written between 1965-69. 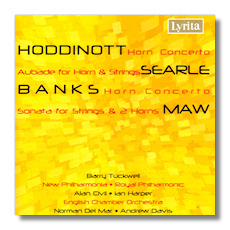 Hoddinott's work is in three distinct movements whilst Banks and Maw opt for the one movement choice. Although they differ slightly, none is short on virtuosity and they make the most out of the soloist's virtuosity. It goes without saying that Tuckwell, Civil and Harper are masters of their instrument and really one couldn't imagine the works being played better. The early 1970's recordings come across quite beautifully for their age and with copious notes in the bag, this disc is an absolute must for the enthusiast of British 20th century music.